DOHA, Qatar, 2015-5-21 — /Travel PR News/ — Qatar Airways, the Global Launch Customer of the A350 XWB, has announced the expansion of its A350 services to Germany, with the new state-of-the-art aircraft being deployed on its Doha-Munich route. Commencing 1st October 2015, the Doha-based airline will be launching the A350 XWB to Munich alongside its existing Boeing 787 Dreamliner service on one of the two double-daily flights to Munich. Beginning 1st November 2015, the second daily flight to Munich will also be operated with the world’s newest wide-body aircraft, the A350 XWB, further strengthening the airline’s position in Germany as a world-class airline providing passengers with an exclusive premium travel experience. Qatar Airways introduced its first and second commercial A350 XWB flights to the German market with flights to Frankfurt in January and March this year. The airline has also recently launched its third A350 aircraft to Singapore and will add its fourth and fifth aircraft with all three daily flights to Singapore scheduled to be operated with the A350 XWB by mid-August, 2015. “The introduction of the A350 XWB aircraft to the Doha-Munich sector, which is an important and strategic route for Qatar Airways, will redefine the in-flight experience for our Munich-based passengers who travel to Doha and onwards to key destinations in the Middle East, Indian sub-continent, Africa, Asia Pacific and the Americas,” said Qatar Airways Group Chief Executive, His Excellency Mr. Akbar Al Baker. Qatar Airways’ A350 XWB boasts outstanding levels of comfort with a spacious seating configuration. Wider seats in both Business and Economy classes, the lowest twin engine noise level of any aircraft, advanced air conditioning technology and full LED mood lighting, all work together to enhance the comfort of passengers, while reducing fatigue after a long flight. Qatar Airways’ A350s feature 283 seats – with 36 seats in Business Class in a 1-2-1 configuration, featuring 80” inch fully flat horizontal beds – and a 247 seating capacity in Economy Class in a 3-3-3 layout. All seats in Business Class have a direct aisle access with 17” HD in-flight entertainment screens. Economy Class features 10.6” in-flight entertainment screens and more space for passengers in window seats, thanks to a vertical side wall panel design. Passengers can also enjoy more than 2,000 movies, games and audio entertainment options on Qatar Airways’ newly revealed inflight entertainment system, “Oryx One – Explore. Play. Share.” – available in both Business and Economy classes. Qatar Airways currently has three Airbus A350 XWB in its fleet of aircraft, with 77 more on order, and is the only airline in the world to operate every family of Airbus’ modern airline portfolio. 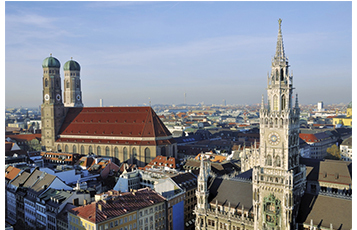 The airline, which has been serving Munich since 1998, currently operates 14 flights each week between Munich and the airline’s Doha base, Hamad International Airport, from which it flies to 146 key leisure and business destinations worldwide. Qatar Airways celebrated its one year anniversary, in October 2014, of joining the oneworld global alliance. Qatar Airways was the first Gulf carrier to join this global airline alliance, enabling its passengers to benefit from almost 1,000 airports in more than 150 countries, with 14,250 daily departures. The award-winning oneworld alliance was named the World’s Best Airline Alliance 2014 by Skytrax for the second year running. For more information, visit our homepage www.qatarairways.com or our sites on Facebook, Twitter, Google+, Instagram, and YouTube. This entry was posted in Airlines, Airports, Flights, Transportation, Travel, Travel Services, Travelers and tagged A350 XWB aircraft, Doha-Munich route, flights to Germany, His Excellency Mr. Akbar Al Baker, Qatar Airways. Bookmark the permalink.